CRAFTSMANSHIP: The movie, like previously stated, was good. Not great, not bad, just good. It was well made. The sets were very adequate. The period setting plenty convincing, down to the constant reminder of flip phones and horizontal phone belt cases. The acting was sufficient, not quite amazing to me, but showing seasoned actors that could do their job well, and that could give staunchly good pizza some pizzaz. CINEMATOGRAPHY: The movie employed a common mixture of mounted and handheld shots to tell the story as well as it could. Once again it was something that I did not notice; good enough to get us to the finish line and not distract us once on the way there. PERFORMANCES: The acting was definitely good. But to see a team of seasoned professional actors all performing their duties to the nth degree within the framework of a standardly good script gave none of them the opportunity to shine more than the other. Most of the roles felt reserved and quiet, downplaying situations that could have been played up just a little bit more. WRITING: The writing was satisfactory, but not special. The dialogue was believable, plainly written like how people in real life might talk, and the pacing of the scenes was acceptable. Like almost everything it was good, maybe even a little better than good, but not quite great. MUSIC: The music was, much like everything else, adequately satisfactory. Although it may be the lowest scorer of all the categories. I can’t remember a single note of the music because none of it stood out. It worked in the scenes where it was supposed to work, and it blended in the background where it was supposed to blend. Not bad, but not great. Not memorable. As the events of Spotlight are based directly on true events, there will be no story section in this review. OVERALL REVIEW: Spotlight is undoubtedly a good movie. The only problem is that it wasn’t special when it could have very likely been great. It is a solid film, standard Oscar winning material, but it’s just not quite complete. A weak climax that felt anti-climactic lends to this, as well as solid performances from the cast that don’t quite hit a home-run, but get you all the way to 3rd base. Everyone in the movie is too real, too convincingly normal that it doesn’t quite impress you. You feel like you are watching five ordinary people conduct standard real world affairs, and you don’t quite feel like you are watching a crack journalist team investigating the biggest story of their career. Constant hints of a powerful adversary that never amount to anything are also a detail that looms through the first and second acts, but then disappears in the third with no resolution. The fact that you are watching a depiction of true events definitely helps the film and its somewhat gloomy tone. 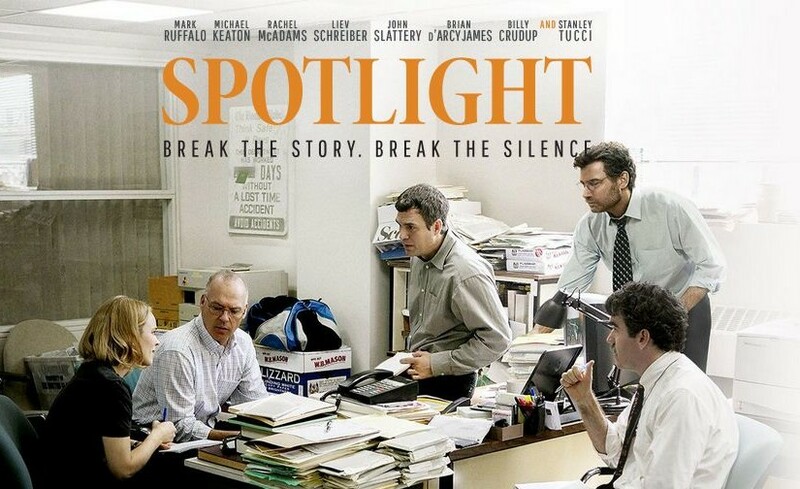 I would likely recommend Spotlight to a friend just because of its journalistic nature and solid presentation of true events that were quite important and impactful to the world, but I would not necessarily recommend it as a good movie. It certainly is a good movie, but it would have been a much better documentary.